You might have noticed that I haven’t been posting new creatures on ABC in a while. I did say I was going on hiatus for the summer, but this one’s been going on for a suspiciously long time. ABC was planned to as a book right from the start – I mean, it’s A Book of Creatures, for Pete’s sake. And while it’s been a wonderful few years writing and illustrating and posting on WordPress, I’ve realized that sooner or later I’m going to have to stop updating. So the creature entries are going to stop. “B-b-but why?” you may well ask. That’s a perfectly reasonable question! I will no longer add new creatures online to make ABC more attractive to potential publishers and, more importantly, to you. Yes, you, good readers, are the reason why I write and paint and research. And if I want to make a book, I will not have you pay cash for a physical copy of what you’re getting on this site for free. Regardless of whether it ends up printed by an established publishing house or if I go the route of crowdfunding, you can rest assured that, in addition to what you see here, you will be getting a lot more entries in the final book. I’m foreseeing more than twice what’s already online. And you can sleep easy knowing that it will all have the ABC Seal Of Approval that guarantees Quality of Research, Writing, and Art. The other question is – what will become of this site? I do intend to continue updating this. There are plenty of book reviews and modern monster appreciations to be done, and now that I’ve committed myself to getting the book rolling, I will be adding new developments here as they happen. This is a major new chapter for ABC. The fun’s just starting, so hang on and watch this space! The Shan Hai Jing is the seminal Chinese bestiary, in fact one of the most creature-packed creature books in existence! (It’s also where Borges got his Chinese fauna from) And if you’re in the unfortunate position of being unable to read Chinese, like myself, you’re going to need a translation. This is where Strassberg’s A Chinese Bestiary (ACB) comes in, and it delivers in spades. You can get your grubby mitts on it here and here. It’s the Shan Hai Jing. Need I say more? I do? Oh. It’s an English translation of the Guideways, with ample commentary and the original illusrations. Once more, this is not a complete compendium of mythical creatures nor does it pretend to be. Its narrow focus is what makes it good. Introductions and Notes frame the Shan Hai Jing translation, which is the meat of the book. The text is broken up by region and by creature, with each notable creature having its own number to identify it in the illustration and (in most cases) commentary. Straightforward and easy to use. It’s a translation of a classic Chinese text. And I don’t read Chinese, so I can’t comment on how good of a translation it is (Chinese-reading ABC readers should feel free to chime in with opinions, if any). But it’s written clearly, thoroughly referenced and footnoted. As mentioned above, there are references and notes for just about everything. As the Shan Hai Jing is itself an ur-reference, there is little need for more – but there is more! These range from folklore notes to Guo Pu’s commentaries and everything in between. If it’s not academic enough for you, there’s always the massive Mathieu translation, which is extremely academic. Also it’s in French. I can’t really sing the praises of this book enough. It’s good. Like Meeting with Monsters it has a (relatively) narrow subject and it uses that to excellent effect. Another must-have book for anyone with a passing interest in Chinese teratology. For your entertainment and general reference, here is a complete list of ABC entries thus far. Note that Fearsome Critters was an entry without a picture, and also that I have Illhveli written up but not as an official entry. Okay, I’m cheating a little. Those aren’t exactly obscure or modern – in fact, they’re some of the best-known, oldest, and most enduring mythical creatures. 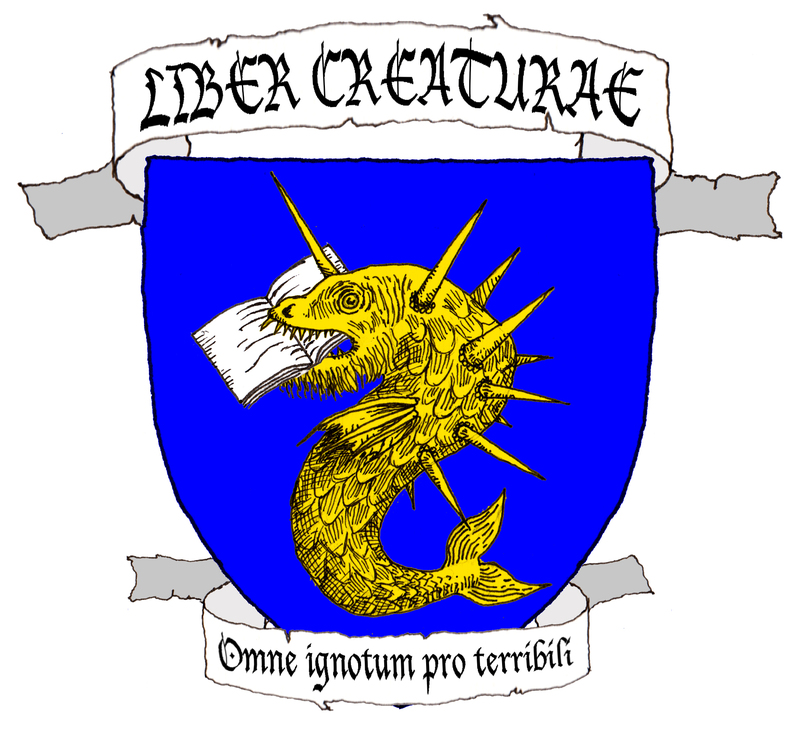 But they are unique renditions of those creatures, and have influenced modern views of them in surprising ways, including providing the answer to a mystery that has plagued DnD scholars. In its April 23, 1951 issue, LIFE Magazine ran a short (4 pages) article titled “Mythical Monsters”, subtitled “These Beasts Existed Only In Man’s Imagination”. It featured seven mythical creatures illustrated by another of my favorite illustrators, Rudolf Freund (I really need to do an effortpost on LIFE artists including Lewicki and Freund). They are beautiful, detailed, and feature some… unusual design choices. The depiction of the su is representative of Freund’s approach. Reading a mustached woman’s face, palm-frond tail, tiger stripes, frog babies, and ample udders into the description is definitely a first. The griffin, on the other hand, is standard, although modern artists would give it eagle’s forelimbs. Pedants would argue that this isn’t a griffin but an opinicus. They’re wrong. The yale in particular looks like it could actually exist, and I love the dynamic pose it’s in. Going to go out on a limb here and claim that this here is the reason why so many basilisks today are drawn as lizards instead of little crowned snakes or freaky reptochickenmutants. Nothing in the text suggest anything lizardy either, so Freund may have been elaborating here. Disclaimer: the break in its middle is because it’s spread across two pages. Looks familiar? That’s right, LIFE used Topsell’s gorgon (itself a renamed catoblepas). In turn, I humbly suggest that this was the inspiration for Dungeons and Dragons’ gorgon. You can stop worrying about where Gygax got his gorgon from and start sleeping easy. … that one JLA comic where a manticore and a griffin double-team our heroes. The manticore is yellow, of course. I always thought that was a cop-out weakness too. The last and best is this spectacular unicorn. I love the different colors and the mismatched elephant feet. This is exactly what unicorns should look like – garbled third and fourth hand accounts of rhinos. I seem to be stuck on sumptuously illustrated books recently. I mentioned this some time back and I thought I’d talk about it here. Les Animaux Fantastiques (LAF) is one of the first books on the subject of mythical creatures that I’ve read (came out 1997). It is also out of print, and has the misfortune of sharing a name with Fantastic Beasts in French. An English translation exists but I’ve never seen it. What’s so special about it then? Let’s find out. You can purchase the book at extortionate prices from here. Hopefully elsewhere at better prices and/or in English as well. LAF is a children’s storybook, to sell it short. It’s a collection of short stories that can be read by or to children, and they are all illustrated in beautiful color by the underrated Marcel Laverdet. It also happens to be part of a myths and legends storybook series, each centered around a type of legend – Arthurian, Celtic, Egyptian, Greek… In this case, all the stories are about fantastic beasts in one way or another. This is not a compendium of creatures, does not claim to be one, and is not being reviewed as such. But it does have a wide variety of worldwide creature stories. Random. Creature stories all over the place. There’s no real organization to the book. Easy reading in French, and presumably in English as well. The stories aren’t that startling or spectacular, but they read well and are nice retellings. Some of them are quite obscure too. They range from retellings of stories (Bellerophon and the Chimera), dramatizations of creature accounts (Boongurunguru), short accounts of various creatures, and so on. The paintings are the main selling point of LAF, and they deliver in spades. They’re colorful, detailed, sometimes cartoony… In fact, I’ll break with ABC review tradition and let a modest sample of illustrations do the talking. Tiddalik the frog (not explicitly named as such) about to explode. An underwater lion of Africa. Incidentally, this tale inspired some research into odd-colored lions in folklore, but the original folktale collected by Frobenius and Fox in African Genesis (1999) makes no mention of the lions being blue. The blue color is an authorial addition, sorry to say. The dreaded Boongurunguru of the Solomon Islands and its demon horde of boars. A Ziph (Ziphius) attacking a sea serpent. A Trolual, with a giant Scandinavian lobster lurking off-camera. Creature overload! Phoenix, Unicorn, Vouivre, and… Chipique? Chipekwe, maybe? Odd spelling, and even odder artistic license employed – the text describes it as having the head of a crocodile on a snake’s body! The Malebete or Troussepoil, getting, erm, what-for. Good for a children’s book, less so for research. Lovely, lovely, lovely. I love the pictures in this, I would definitely rate it as one of the creature books that got me into creatures. But it’s not particularly academic, does not cite sources, and makes some errors. I give it 4/5, commutable to 3/5 or 5/5 depending on how strict or generous I’m feeling. Great introduction to the world of fantastic beasts though. The Unprecedented Discovery of the Dragon Islands (or TUDDI for short) by John Kelly and Kate Scarborough is a book which I remember very fondly. I first saw it as a child in a bookstore that no longer exists, and my memories of it got so fuzzy that I eventually became convinced I had dreamt it up. Searching for “realistic dragon book”, “living trap monster”, and similar terms led nowhere. Eventually, by some quirk of fate I searched Amazon for “dragon island” and checked the results for the 90s… and there it was. I hadn’t imagined it after all. And since it’s mostly pictures, I’m covering it under Obscure Modern Monsters rather than ABC Reviews (needless to say I give it 5 gigelorums). You needn’t search for it as you can buy it here and here. TUDDI is a big, colorful coffee-table book for children of all ages. It presents itself as the illustrated diary of young Lord Nathaniel Parker as he and his ship get lost at sea, and end up finding a fabulous archipelago where dragons and sea serpents exist. Lord Parker writes to Belinda, his main squeeze, and a lot of TUDDI’s humor comes from his stuffy aristocratisms. The book ends all too quickly and suddenly – sequel hook? It certainly feels like the authors could fill several more “episodes”, but sadly I don’t think they have (if you’re the authors and you’re reading this, take note). The main reason you would want to read TUDDI as fans of ABC, mythical creatures, speculative biology, speculative evolution, and all-around great art, is the creatures. Some are new takes on old classics, while others are completely new organisms with no equivalents. Even speculative insects and plants are painted in loving detail. I’ll just give a small sample of what’s inside. There are unicorns. There are griffons, which hunt in packs, feed on the unicorns, and make a go at our heroes. There are giant ratites with faces that look like the old duck-rabbit illusion. There are carnivorous plants. There are Cambrian relict arthropods. There are aquatic-adapted shrew-things. The gorgon is an all-original creation and one of the things I remember most from the book. It’s literally a living bear-trap, one that lies camouflaged amid tree roots and snaps shut on whatever steps on it. It’s a nasty piece of work, and I like that a lot of it is left to the imagination. We’re not even sure what it evolved from, but I’m guessing some kind of primate? Of course, it wouldn’t be the Dragon Islands without dragons, would it? The dragons themselves are marvelous organic balloons, big pink bloated floating translucent fire-breathing plankton-straining gilled soarers. They’re exactly as awesome as they sound.